Geometry classes, Problem 1309. Triangle, Circle, Inradius, Excircle, Tangent, Exradius, Measurement. 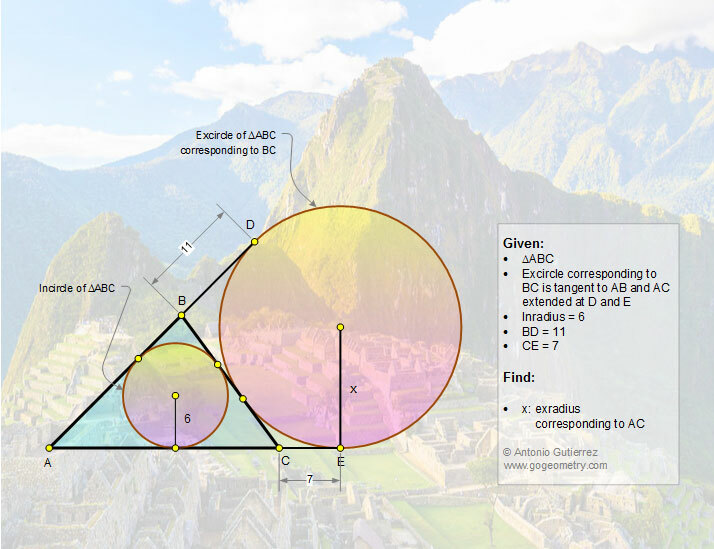 Machu Picchu background, Math teacher Master Degree. College, SAT Prep. Elearning, Online math tutor, LMS. Problem 1309: Triangle, Circle, Inradius, Excircle, Tangent, Exradius, Measurement. The figure below shows a triangle ABC with the excircle corresponding to BC tangent to AB and AC extended at D and E, respectively. If BD = 11, CE = 7, and the inradius = 6, find the measure of the exradius corresponding to BC. Background of Problem 1309: Machu Picchu, "Lost City of the Incas". Machu Picchu called the "Lost City of the Incas" is one of the New Seven Wonders of the World and UNESCO World Heritage Site.